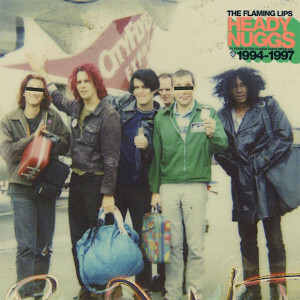 Listening to the new Flaming Lips’ Heady Nuggs three-disc collection of music from 1994-1997, one is reminded of what a good band they were before they became a great band. In addition to the early tracks, the collection includes a number of oddities and rarities as well as a number of live tracks from a show in Seattle in 1996. The retrospective includes four different sections and spans a large musical ground ranging from spacey psychedelia to abrasive grunge to quirky weirdness but there is a consistent individuality through all of it. The first section, Clouds Taste Metallic, contains a few classic Flaming Lips songs such as the very 90’s indie rock era-sounding “When You Smile” and “Kim’s Watermelon Gun,” both terrific songs. There are also some really interesting covers and live versions in the The King Bug Laughs section including an experimental take on Bowie’s “Life On Mars,” a blown-out cover of John Lennon’s “Nobody Told Me,” as well as a more stripped-down, live version of “She Don’t Use Jelly” Live at KJ103. The collection gives a great taste of the band’s early developments and is a no-brainer for any fan who didn’t want to splurge on the full box set that was put out last year.